Here we are – the beginning of the Spring Training – in a year when things should actually be pretty great. The Cubs have a full rotation of veteran starters, a lineup with plenty of options, youth, and upside (though it could probably use one more sure thing), and a bullpen. 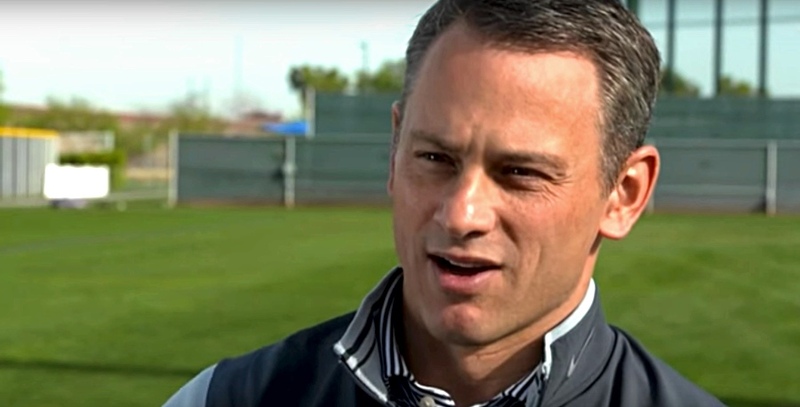 Cubs VP of Scouting and Player Development Jason McLeod (670 the Score) and General Manager Jed Hoyer (ESPN 1000) recently jumped on the radio to discuss each of those components – both in the big leagues and minors – and I’ve collected some of the highlights below. Back in the early years of the rebuild, the Cubs scouting staff held too high of a standard for the pitchers they targeted/selected. Because while focusing on guys who can already throw strikes or who have repeatable deliveries is not a bad thing, McLeod believes they prematurely eliminated far too many pitchers that otherwise deserved their attention. That’s something they’re changing now. In short, McLeod is looking for the Cubs to “add a little more risk” to their selections, because that usually means a little more upside, too. McLeod added that losing Derek Johnson (Brewers pitching coach) and Jim Brower (Mariners bullpen coach) didn’t help. 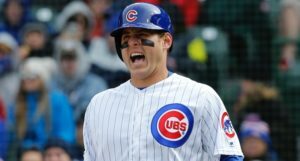 McLeod hopes that the Cubs don’t have to promote anybody to the big leagues out of necessity, but says that Alec Mills is a guy you can go get right away with no issue. And then later suggested (to my excitement) that Duncan Robinson, with his five-pitch-mix, is another guy you wouldn’t be scared to call up sooner than later. Robinson made 24 starts at Double-A last season (3.31 ERA, 3.20 FIP) and then two more at Triple-A (0.82 ERA, 3.11 FIP). He’s not an overpowering guy, but if he could translate that upper-minors success to the big leagues … woo baby, we might just have an actual starting pitcher developed by the Cubs! McLeod suggests that it’s hard to continue a pitcher’s development in the big leagues, when every game is so important/has playoff implications. And, like, yeah, sure, but also … why don’t we get a few guys who are ready for that challenge and then discuss where we can fit them in. 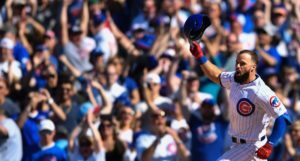 Zack Short (17th round) and Trent Giambrone (22nd round) come in for some special praise as guys who could surprise us the way later-round-pick David Bote did last year. To be sure, they’re not likely future stars, but they might each force the issue this year, given the way they’ve developed. McLeod says every team needs players like that. McLeod doesn’t get into the specifics, but he offered a really interesting discussion about the non-baseball questions he asks potential draft picks. Basically, McLeod knows that the guys he’s interviewing have been extremely coached-up *and* are likely meeting with all 30 teams, so he doesn’t want to repeat the same old-same-old. He believes he can learn a lot about a person/player this way, and by the enthusiasm of his explanation, I believe he believes that. Don’t miss McLeod’s interview, it was a good one. Now, let’s move onto Hoyer. Hoyer said this was the second most difficult offseason of his career, the first being when Theo Epstein “took a sabbatical” and “left in a gorilla suit” back in 2005 with the Red Sox. Hoyer was left in charge with Ben Cherington as co-GMs and he regrets not re-signing Johnny Damon (apparently he had to have a press conference about not-resigning Damon and Epstein had a good laugh about that). Hoyer shares a bit on Yu Darvish’s mental state right now: “Darvish has a good look in his eye right now. He feels great. He feels healthy. I think he wants … to prove people wrong.” And suggests it’s not actually all that unlike how the entire team feels. In a way, Hoyer says, the doubt is a good thing. Everyone left with a bad taste in their mouth and it’s going to be a motivator. Hoyer could not have been more effusive about Kris Bryant’s health being 100%. And I am extremely smiling. He got into more details, but the bottom line is Bryant is BACK. 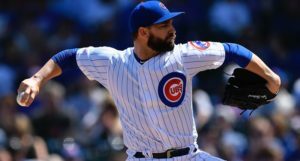 At a certain point, 2018 became a lost year for Tyler Chatwood. Unfortunately, a lot of things you have to do to address/fix those problem are just not possible in-season. He wouldn’t answer what the plan was for Chatwood this year, but Hoyer said that he still believes in his stuff, he has a great relationship with Tommy Hottovy, and hopes the winter did what it could to fix his issues. Hoyer was a little bit surprisingly in favor of the proposed rules changes to baseball, including things like the DH in the NL and batter-minimums for relievers. “We’re always afraid to change baseball. We have this idea that somehow it’s a sport that’s timeless and therefore we don’t want to alter certain things and i disagree. We have to realize that generations change and there’s evolution.” Hoyer cited the massive increase in velocity and evolution in strategy kneecapping offense (much of which has been brought about by technology). For what it’s worth, Hoyer was less interested in on-field changes like banning shifts, but things roster usage and player usage – which shouldn’t affect what you see on the field – should be fair game. Hoyer cites the free agent market and draft as unfair battlegrounds for the American League, who have the designated hitter. BRING ME THE DH. To close, Hoyer discussed the cold free agent market – and uses other sports like the NBA and NHL – as mirrors to baseball, but we’ve traversed this ground many times before. If you’d like to hear what he had to say, the conversation starts around the 13-minute mark and goes to the end.